When talking about the major factions, the 5th one often gets overlooked, the mysterious and enigmatic Jovians. Not much is known about them, as they prefer to keep to themselves, to the point they shut down all gates that connected them to the other nations. This could be done as they are the most advanced race currently known. The Jovians are among the oldest and technologically most advanced nations in the Eden cluster, gifted with insatiable curiosity for information of any kind. This insatiable curiosity is their main drive for most of their actions and the reason of their extremely well developed intelligence agency. Coupled with their technological superiority, it is assured that nothing happens in Eden without the Jovians knowing about it. However, their curiosity also had a downside... in their eagerness to explore their DNA and modify it to remove imperfections, they went too far, creating the Jovian disease. This disease is a non-infectious genetic affliction and is a result of their heavy tampering with their own DNA. Jovians suffering from it become extremely depressed and die within weeks, losing their will to live. This caused the fall of the original Jovian Empire that was located in the Heaven Constellation, their home system Utopia now an Angel base. The current Jovians are emigrants who fled their dying relatives in massive Jovian Motherships in order to rebuild the Jovian Empire in another part of the cluster. Much of their efforts and actions are tied to finding a treatment and perhaps even a cure for the dreaded Jovian Disease. Despite that this new Jove Empire is but a shadow of the original one, their technology still outclasses the four nations by a wide margin. From this new location, they began meddling in the affairs of the four factions for purposes only they know. In the history of the Eden cluster, the Jovians are rarely mentioned, yet the few times they are involved, it is for events that changed the course of history. This has given rise to the reputation that you best don't mess with the Jovians. But along with this, they also show that if you followed their sometimes odd demands for information of any kind, you would be rewarded greatly with advanced technology. This is the most well known Jovian encounter in the history of the cluster and the only known direct confrontation of their military force. The Amarrians pursued their Reclaiming Doctrine, under which they enslaved the Minmatar population and wanted to press on, enslaving the Jovians under their religious doctrine as well. The excellent Jovian intelligence network however allowed them to be prepared to the finest details, turning the defense against the Amarr invasion into a display of power and might of the Jovians. Ever since this event, no other nation ever took up arms against them again. Shortly after their defeat at the hands of the Jove, the Amarr were faced with a nation-wide slave revolt. Backed by the Jove Empire & Gallente Federation, the Minmatar rose to arms, throwing off the rule of their oppressors. The Jove contributed to the success by undermining the Amarr command structure by subterfuge & spies, allowing the Minmatar to prepare for incoming Amarr battle fleets and successfully repel them. In the end, the Minmatar rebellion was victorious and so the Republic was founded, backed by the Gallente Federation. 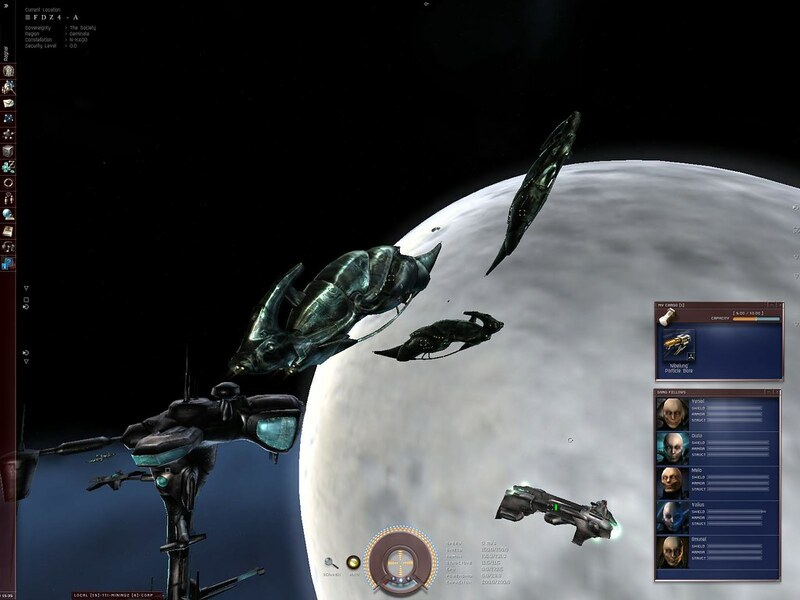 The Jovians assisted the Rebellion in order to force the Amarr to halt any future attacks on their Empire, showcasing that anyone who opposed the Jove would not only have to face their powerful technology, but also their deeply integrated intelligence network that the Jove built up across the factions of New Eden! 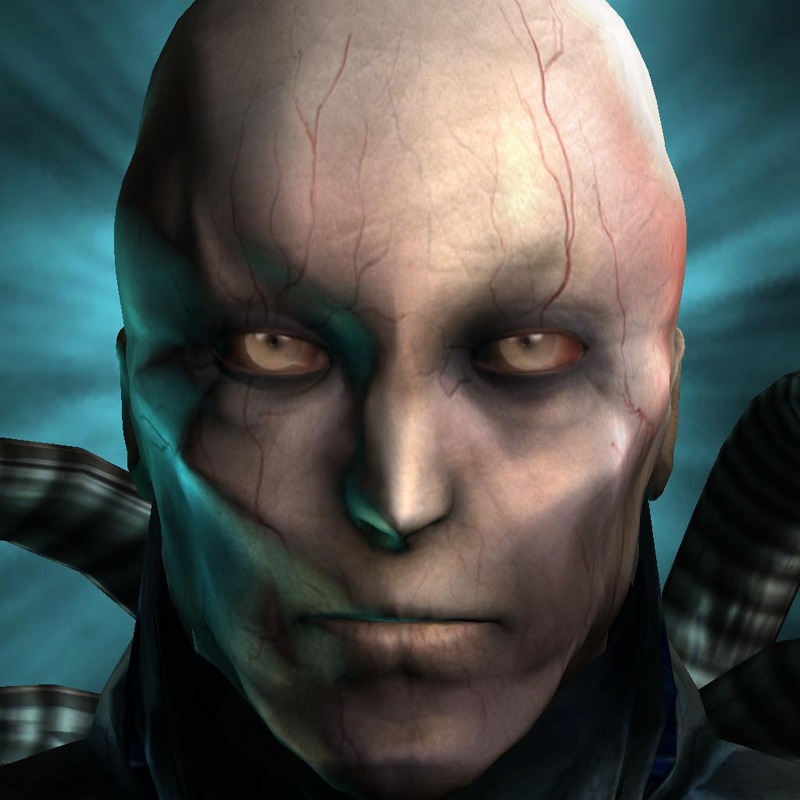 During the Caldari/Gallente secession war, the Jove contacted the Ishukone Corporation and traded to them the capsule-technology in exchange for information and unknown devices. This trade helped the Caldari to counter their losing edge. For a long time, the Caldari could successfully stand against the might of the Gallente fleet thanks to their excellent one man fighters. But eventually, the Gallente managed to develop combat-drones to counter them, causing the State to lose its only advantage against the Gallente military. However, thanks to the Jove trading capsule technology, the Caldari could turn their frigates into one-man ships, allowing the war to drone on. This allowed the Caldari to inflict massive losses on the Gallente in a direct conflict against their major fleets. There are various Jove-linked corporations and institutions spread across the four nations. The most well known is the Society of Conscious Thought. Once founded by the Jovian Ior Labron in an attempt to discover the meaning of Life, it now functions as a highly respected and qualified education center. The rules for admission however are shrouded in mystery and are only know to the Jove and their placeholder administrators in the SoCT academies. In the last few decades, non-SoCT members have been allowed to enter as well to enjoy this Jovian style education. Almost everyone that graduates at the SoCT academies attains high positions in society, becoming directors of interstellar corporations or highly successful politicians. It is due to this that the SoCT is seen as a place to educate & raise future leaders. They manage to instill this high grade of successful ambition through a method known as hyperconsciousness, a teaching method shrouded in mystery. Founded shortly after all 5 races made first contact with each other in order to maintain peace in the cluster. The Jove contributed technology to the DED division in order to allow them to police known space extremely efficiently. Most capsuleers know them as the extremely lethal Concord Police ships, who arrive after unlawful aggression to punish the offender in Highsec. This is currently the only way to experience Jove technology directly, and is not considered a healthy way to experience it. This lethal killbeam weapon was a recent addition to the Concord weapon arsenal, and the Jove allowed use of this devastating weapon after capsuleers managed to successfully oppose Concord in Yulai, their HQ system. When the true nature of Kuvakei's experiments became known, all 5 nations banded together against Sansha's Nation. Among them were the Jove, while not directly involved, it's suspected they managed to negotiate this Alliance of Empires into being through Concord. Further involvement was the sharing of intel they had on Nation allowing the 4 to strike efficiently into territories they hardly knew. The reason on why the Jove got involved are speculation, but it's suspected it had to do with Kuvakei's experiments on Jove capsule technology, using it to create his True Slaves, beings unconditionally loyal to Kuvakei, yet with a will of their own. While many of the factions dream of developing a weapon so powerful & devastation that the mere threat of using it would make the others back down, they never succeeded in developing such weapon. The development of the Iapetan Titans was the latest such attempt, but as they eventually were developed by all four factions, they never achieved their original intent, namely to make the opponent back down by the mere threat of deploying them. A well known recent super-weapon is of course Jamyl Sarum's Abaddon who fired a weapon of unknown design at the invading Elder fleet in Mekhios, decimating them fully in a single blast! However, there is also the very disturbing rumour, backed up by scraps of intel gathered by the four nations that the Jovians themselves are developing a devastating super-weapon, capable of annihilating worlds. While the Jovians never responded to these allegations, it is feared they are just waiting for the right opportunity to test the weapon and display to the rest of the cluster their superiority, showcasing that any attempt to invade or attack the Jove would lead to terrible consequences! About a century ago, the original systems of the Old Jovians were discovered by scavengers and raiders. Eventually they banded together as the Angel Cartel, allowing them to use and develop these old Jovian artefacts and stations they found. As a result of this, the Angel Cartel is one of the most powerful pirate organisations in known space. It's suspected this rise of power can be attributed to uncovered Jovian technology. One only has to look at the Angel ships to see the semblance with some of the sleek Jovian ships. In recent times the Jovians have become very quiet, especially after the death of the Jovian contact Veniel and his exiled brother Ouria. In fact, after those incidents, the Jovians have remained quiet in communications except for one last tour by their ambassador. After that, it is silence, save for a few rogue incidents. Discoveries concerning the Jove the past few years do paint an image of a dying nation, unwilling to reveal itself. This tale is a good example of the Jovian thirst for information, making trades and exchanges that don't seem to make sense. In this particular encounter, the Jovian Veniel offered a group of privateers a way out of a lethal situation in exchange for a corpse they found by calling in a Concord taskforce in nullsec. Veniel even went so far as to uncover the knowledge of dozens of stations and jumpgates in exchange for Concord's assistance in this matter. To us, it just seems like an outrageous deal, just to get a corpse, but Jovian motivations are always shrouded in mystery, and any deal you make with them might be in their favor from their point of view. Early in the history of the first immortal capsuleers, a young Jovian explored empire space in his mining frigate. There he met a man, Beckull, who entertained him with talks and tales. For this, he gave the capsuleer one of his mining lasers, believing it to be of little value. However, as this was a Jovian mining laser, it's technology surpassed anything the empires could produce. Once it was sold to a major capsuleer organisation it caused an outrage among the community, targeting the Jovians for providing an unfair advantage. However, Veniel brokered a deal with the corporation in question, exchanging the Tech V mining laser for an original tech II mining laser blueprint. While this was still more advanced than what the empires had, it was much closer to existing technology. Shortly after the Jovian Mining Laser incident, a rogue Jove admiral, displeased with the actions of the Directorate set out to the Stain region with his squadron and wanted to trade Tech II with the main competitors who lost out on the previous Tech II deal. However, as word got out, many went there as well and it resulted into a massive manhunt. During this hunt, Veniel was mistaken for his brother and was killed. Eventually the hunt for Admiral Ouria came to an end in a large battle. He and his squadron of Eidelon Battleships were destroyed, the tech II mining laser blueprints were looted by various factions in an intense fight for the precious cargo. During this, pieces of Trinary data were obtained. The Jovians surprised all when they announced their Ambassador would go on a tour, visiting the four main factions within an hour! They unveiled they planned to do this with a matter transporter. However when initiating the device, something went horribly wrong and the ambassador and his ship got transported in little bits to hundreds of stations across the cluster. In addition to this, due to the nature of the accident, they needed a large part of his original bodyparts to restore him. Immediately the four nations and various capsuleers went on collecting it all to help the Jovians. However, the Bloodraiders had plans of their own and collected as many bloodsamples as they could. Despite being often raided by capsuleers as an 'easy source' for Jovian bodyparts, the Bloodraiders announced they accomplished their goal, whatever it may be. In the end, enough biomatter was gathered to restore the unfortunate Ambassador. The fragments of the ship, who were also spread out were of seemingly no interest to the Jovians and were happily studied by scientists & capsuleers. As a reward for their assistance, capsuleers received blueprints of a yet unknown technology at the time, cloaking devices! Once restored, Misu Baniya continued his Grand Tour of the Eden cluster, visiting not only the four great factions, but also various nullsec capsuleer alliances. After it was revealed the Jovians saw them as sovereign states, adding them to the Jovian Registry as independant factions, the Amarr, Minmatar and Gallente protested in earnest, claiming these nullsec organisations are nothing more but organized lawless groups. The Caldari State on the other hand supported the Jovian decision, stating that the Capsuleer Alliances in nullsec are indeed budding young nations, setting their first steps as a sovereign state. Not much is known about this encounter, only that during a routine gatecamp in nullsec an Eidolon Battleship appeared at the gate. Following standard NBSI procedure, the capsuleerfleet enganged the Jove battleship. Despite this aggression, the Jovians did not return fire and after several minutes of sustained fire on this ship, they left the battle, leaving behind a bewildered capsuleerfleet. No known events are linked to this encounter. Sansha Nation presence in Jove Space! During the first waves of Nation attacks in known space after Kuvakei's announcement; capsuleers frantically tried to discover where the wormholes that launched Sansha's fleets originated from. No response came from the Jovians after this news became public. Currently, nothing is known between the Jove/Sansha relations. To this day, it's not known if Jove granted Sansha's Nation access to their space and some of their tech, or that Kuvakei invaded and took it by force. It's important to note that the last Jove message was related to this, as they used Concord as intermediate to relay info that they removed Sansha from their space. Research done by capsuleers on the Sleepers has supported a very interesting but also dark theory. It is suspected the Sleepers were the Jovians who were left behind when their more healthy people fled in massive motherships from their original homes to current Jove space. Left behind, these Jove were doomed to die, unless hooked to virtual reality systems that delayed the fatality of the Jovian Disease. Desperately looking for a more permanent remedy or even a cure, they turned towards their neighbours, the Yan Jung. The relics found point to forceful conquest and eventual genocide rather than asking for help with their condition. Seemingly unable to find a remedy, they turned to Wormhole space, chasing the other faction they knew, the Talocans. In their drive to find a cure, the doomed Jovians destroyed the Talocan civilisation, turning them into nothing more but labrats for experiments in order to discover a remedy. The current state of the Sleepers seems to indicate they haven't found a cure, but also that their research is seemingly continuing automated, while they rest in their virtual environments, awaiting the result of their experiments. All in all, the Jovians are an enigmatic & reclusive race, valuing information above all else. In pursuit of this, they tend to trigger events that involve large parts of the cluster. This is due to their advanced technology and their apparent willingness to trade knowledge of said technology for sometimes seemingly insignificant information. In short; if a Jovian shows up, expect trouble to follow suit! This is intriguing! A lot of these things I didn't know. I should have paid more attention to my history lessons.. I didn't know about the Yan Jung and the Talocans before, I only thought that the Jovians and the Sleepers were the only groups with the most advanced tech.